Luxury vinyl flooring has become a popular choice in residential and commercial settings because it combines natural style with premium comfort and performance. Buddy Allen Carpet One Floor & Home is your local retailer for all things luxury vinyl flooring, so be sure to visit our Nashville, TN showroom to see our entire collection and to learn more. Luxury vinyl flooring is one of the fastest growing flooring categories on the market. They combine the authentic looks of natural flooring with the durability you expect from a vinyl floor. Luxury vinyl flooring is available in plank and tile options for a truly authentic look in your home. With luxury vinyl, almost no room is off limits. It can withstand the foot traffic you typically see in living rooms and it is comfortable enough for bedrooms. It can even handle the traffic and moisture you typically find in a kitchen. In high-traffic or high-moisture areas like bathrooms, however, we do recommend choosing a waterproof luxury vinyl floor. Other places you can install luxury vinyl are basements, entryways, and even your hallways. When it comes to luxury vinyl, you have different choices including vinyl tile flooring and vinyl plank flooring. Luxury vinyl planks and tiles are great for replicating authentic natural flooring looks. Sheet vinyl flooring is the original vinyl option that is noted for its installation versatility, and its nature-inspired visuals and waterproof qualities are slowing bringing back its popularity. For the most part, all luxury vinyl floors are considered moisture resistant, but there are luxury vinyl options that are entirely waterproof. Waterproof flooring has a watertight surface and a strong waterproof core that prevents the planks and tiles from ever expanding or contracting when exposed to moisture. This core also stops moisture from reaching the subfloor, and makes wiping up spills easy. Buddy Allen Carpet One Floor & Home is your local source for all things flooring. As a member of the Carpet One Floor & Home cooperative, we are able to offer popular name brand floors. Our featured luxury vinyl flooring brands are Invincible™, Earthscapes™, and VERÓSTONE™, all of which are Carpet One exclusives. Caring for your vinyl floors is easier than you think. A simple sweep can keep your floors looking beautiful. Follow the link below to learn about a few vinyl care tips. The type of vinyl flooring you choose for your home not only impacts the style of your home, but also how the floor will function. 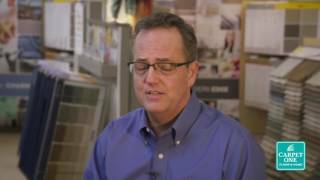 Follow the link below to learn more about tile, plank, and sheet vinyl. As tough as it is beautiful, luxury vinyl flooring gives us plenty of possibilities for the kitchen or bathroom. This incredible synthetic provides all the looks you love- even realistic visuals inspired by hardwood, stone, and tile.